What are attars and how are they made? Kannauj, a small, busy Northern Indian town in the state of Utter Pradesh has been the attar capital of India since time immemorial. The families that have made attars there for generations guard the secrets of fabrication close to their chests. Each family has their own traditional formulation and production techniques. A large quantity of high-quality, fresh plant material (usually flowers). A gentle, very long distillation under controlled pressure. An intimate blending of aromatic molecules with sandalwood oil during the distillation process. A large copper vessel known as the ‘deg’ is filled with plant material and water and sealed with local mud or clay. Another copper vessel with a spherical belly and long neck called a ‘Bhapka’, which means steam in Hindi is used as a collecting vessel. A hollow, bamboo tube connects the two vessels together. It is insulated with natural rope and called a ‘Chonga’. The bhapka is filled with pure Indian sandalwood essential oil. The bamboo pipe goes from the deq into the bhakpa which rests in cooling tanks, where the steam is condensed back into aromatic liquid. Once everything is sealed and ready, the fires are lit and fed with wood or cow dung. The fires will continue for approximately eight hours at a time. 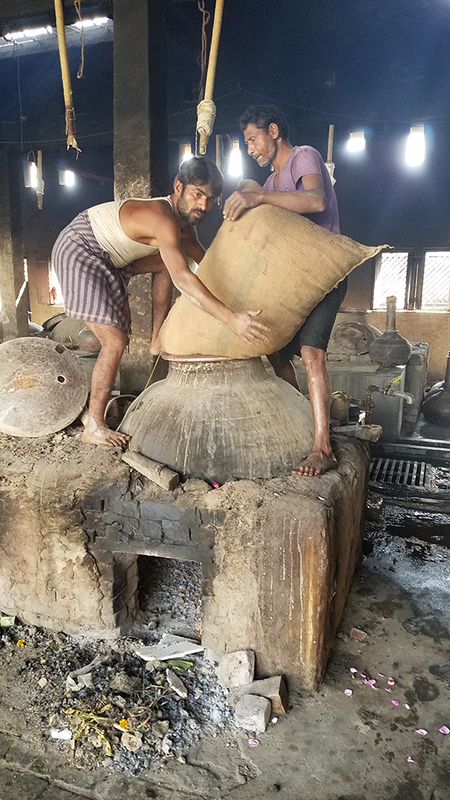 The distillation process is repeated over a period of about two weeks, enriching the sandalwood essential oil repeatedly with the fragile floral aromas until the distiller considers that the sandalwood is carrying just the right amount of the floral aroma. The attars are stored in buffalo leather bottles as they help the sedimentation and removal of any humidity. Then they are aged. The ageing process can take from one to ten years depending on the plants distilled and the desired outcomes.